To know me is to know I love anything to do with the Amish. For more than 10 years my family has traveled to Lancaster, Pa and stayed for 6 days at a time… never wanting to leave. It is peaceful and serene. The countryside…breathtaking. I always thought I wanted to move to the country when I got older. But country in RI is to be in the middle of nowhere and placed in the middle of hills and tall pine trees. You cannot see the horizon as you can in PA. There are a couple of main roads with traffic and lights, but you can take a side road, and suddenly you are in the middle of paradise. Every time we go there, we take a side road and travel up a distance until we are in the middle of never-ending farms. We shut off the car, and you hear nothing! Look up ! There are no wires over your head. It’s so quiet, you can hear the rustling of the grass and towering cornstalks. The many meadow butterflies flit close to the ground, and in the fields,there are cows grazing at every turn. It’s beautiful. What adds to the already peaceful and serene setting are the Amish people who ride back and forth in their black and grey buggies. They are pulled by sleek, brown horses. The sound of their trotting is like music to me, and I open a window as we pass just to listen. The Amish people are friendly, but quiet. The women wear bright dresses and heart-shaped bonnets and often go barefoot on hot summer days. The men seem to never sweat in their heavy, black pants and straw hats. You have to experience this to completely understand the feeling you have when you are there, and somehow, you will never want to leave. The experience always makes me feel refreshed, and lets me feel I can go on for the rest of the year, until I go back again. As long as I can go back! Well, it’s been about 6 years since we have gone last, and now even the kids miss it. 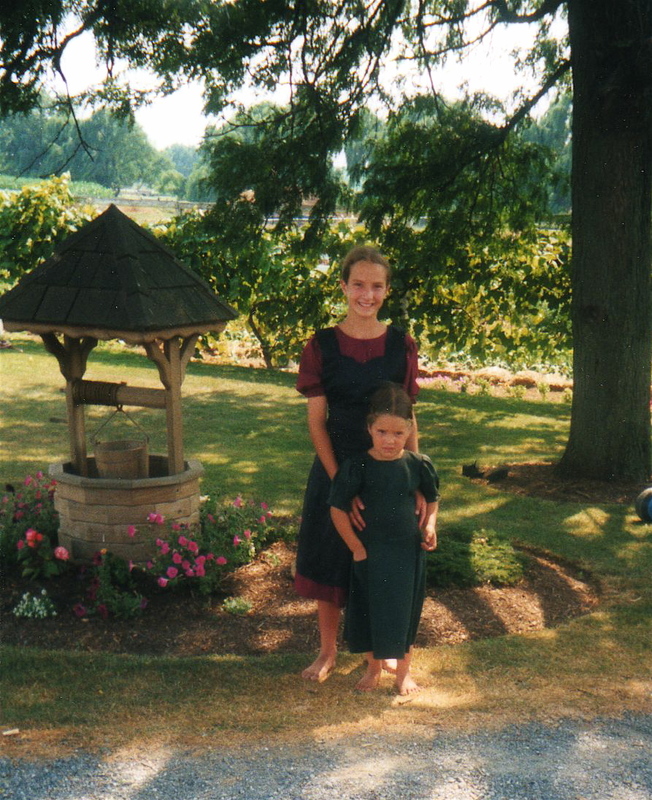 We had made close friends with an Amish family there. They have a quilt shop on their property. They have a daughter of Caitlin’s age, and we have eaten at their home, and once, they even came out to dinner with us. Kathryn, the amish girl, invited us one year to her school house to meet everyone. We went (at first hesitated) and realized “we” were the one’s being stared at and whispered about. But they gave us gifts and asked questions and were so friendly. I’m so glad we went. We will never forget the experience. The amish family was sadly one of the families that were affected by that awful Nickel Mines shooting. Their grandaughter was the 13 year old Marion Fisher, and all I could do was cry. I have tried to contact them since then with cards and such, with no response. We are going to try to go this summer as a family again, before everyone here goes their separate ways with work and college, etc. We want to remember the feeling again. The calmness and just enjoying nature and each other’s company in a less stressed environment. To be childlike again…and also, just maybe, we will still find that Kathryn will still be there. We can only hope! This entry was posted in Uncategorized and tagged Amish, beautiful, buggy, calm, corn, country, farm, farms, friendly, horizon, inspire, Lancaster Pennsylvania, Nickel Mines, peaceful, Pennsylvania, quaint, serene, Stoltzfus, travel.